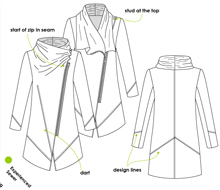 Jane Foster challenged her students to make a garment using the Australian pattern company StyleARC. 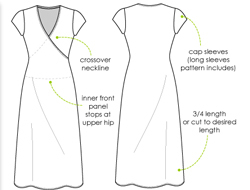 Students worked on their garments at one of Jane's Sewing Retreats or during her studio sewing classes. 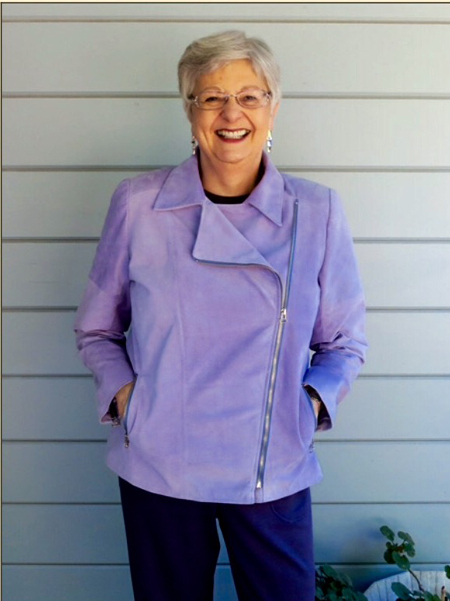 All of the women created fabulous garments, and they showed them off in a style show in Jane's studio. 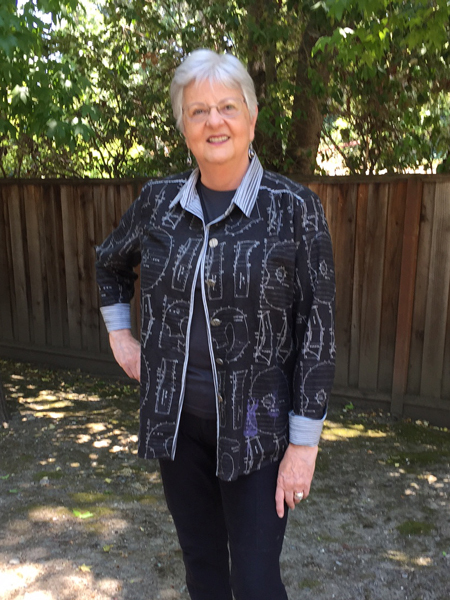 We hope this inspires you to try a StyleARC pattern, and remember Jane can help you in her sew labs or at her sewing retreats with construction, fitting, and fabric choices. 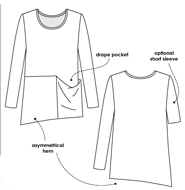 Enjoy looking at the photos below of the garments made using StyleARC patterns. 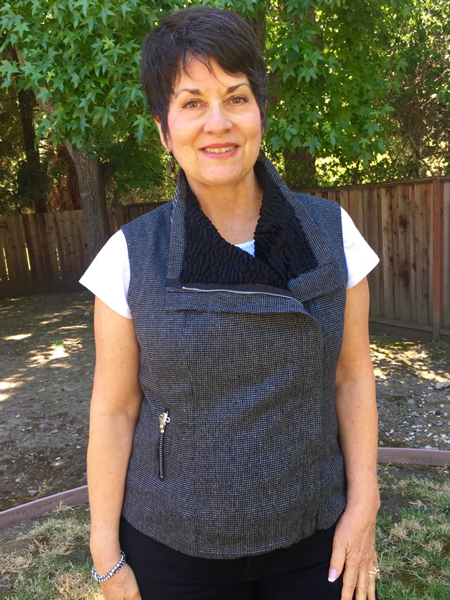 Santina made the StyleARC Eddie Biker Vest in wool with a faux Persian lamb collar and trimmed with topstitching. 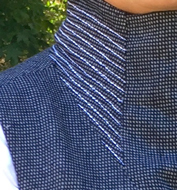 The collar has rows of channel stitching. 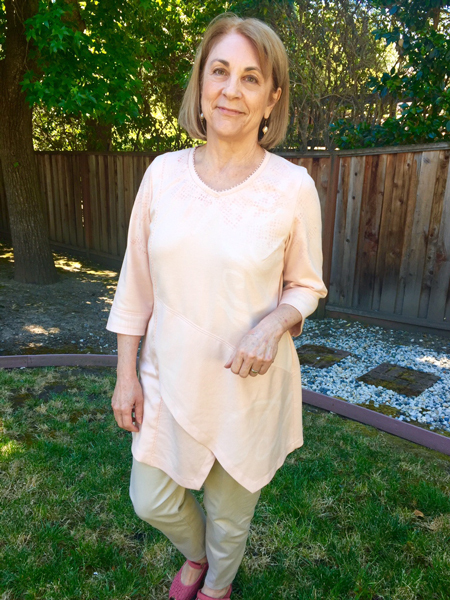 Vicki chose lightweight linen for her Lani WovenTunic and she enhanced the look with piping and top stitching. 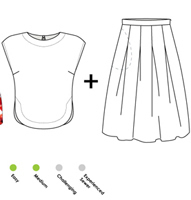 Vicki also made the Brook Skirt to wear under her tunic. 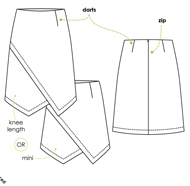 She underlined the linen skirt with silk organza to lessen the creasing. 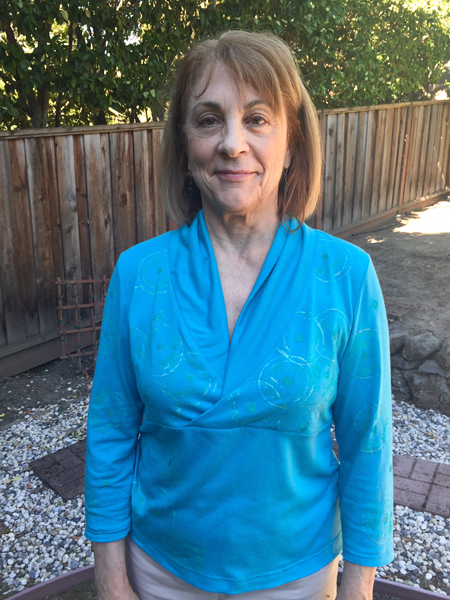 Lark used a knit for her Lani WovenTunic. 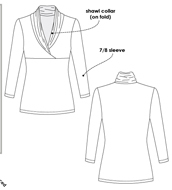 She screened the fabric with light color and used a picot edged trim around the neck and in the seams. 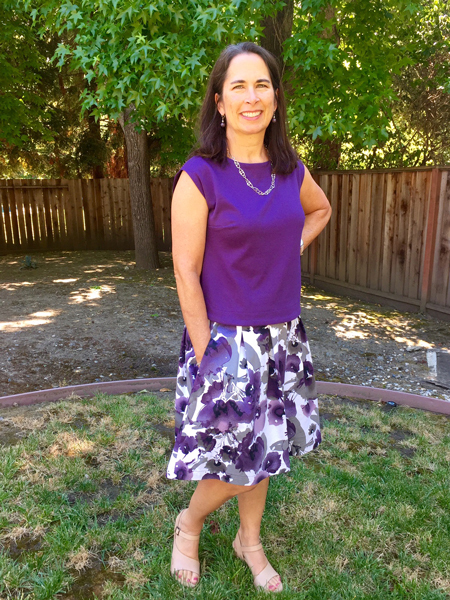 Kathleen's textured fabric came Stone Mountain and Daughter, and the color looks great on her. 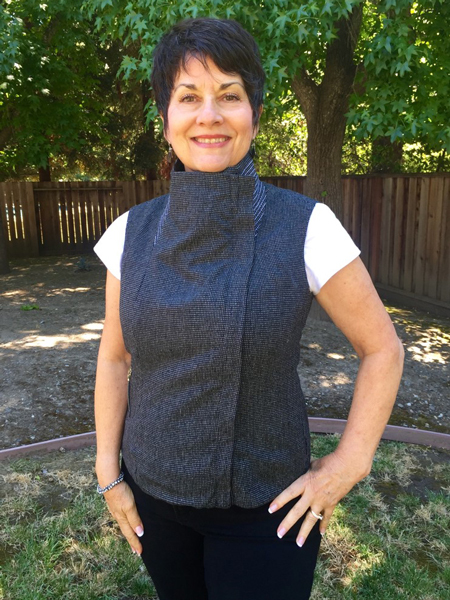 Her necklace complements the trim on this StyleARC Lani WovenTunic. 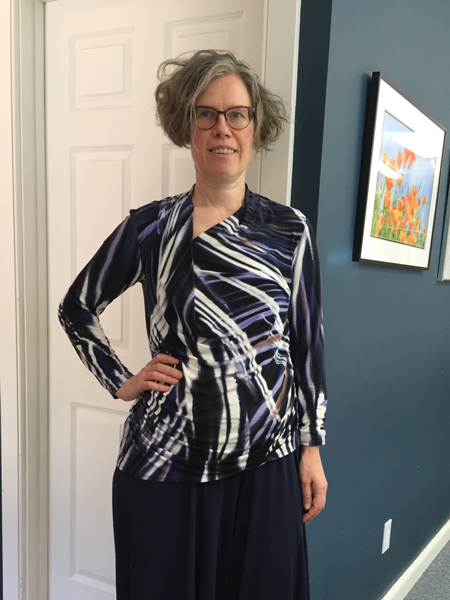 Jasna needed a few fitting changes, but now she has a custom pattern of the Issy Knit Top. 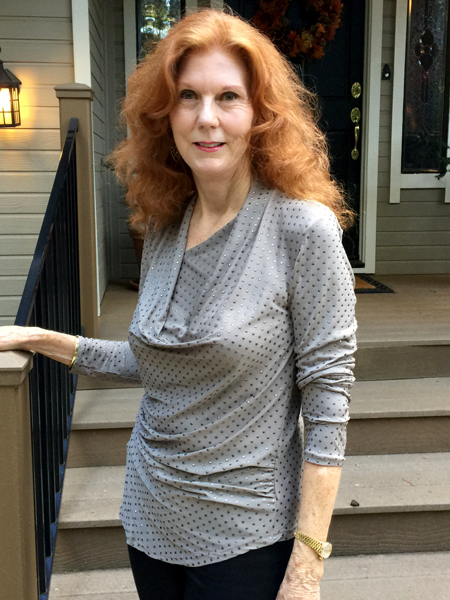 Sharon found this lovely knit on a trip to New York with Jane. 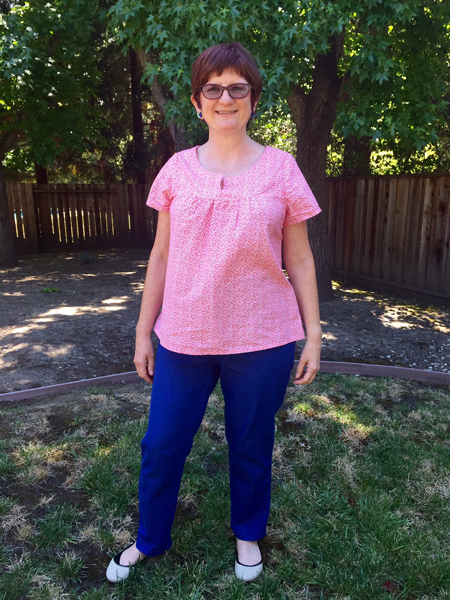 The Issy Knit Top by StyleARC is one of her favorite patterns. 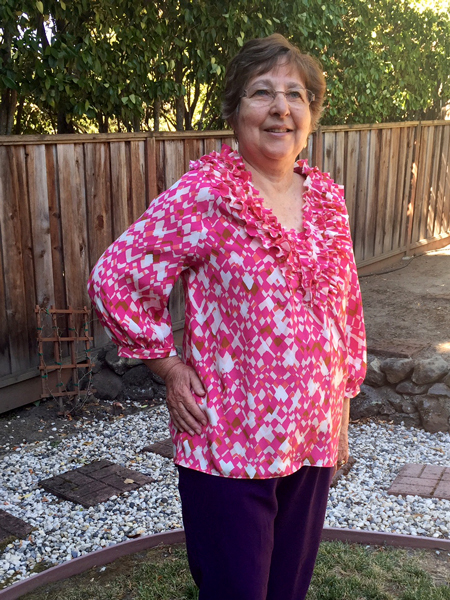 Jasna made this Lotti Top using three colors of fabrics. 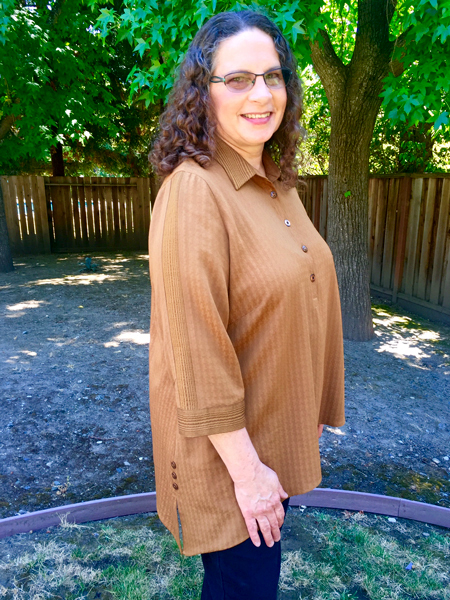 Jeanne is wearing the Maris Top made from a knit from Stone Mountain and Daughter Fabrics. 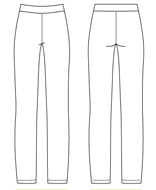 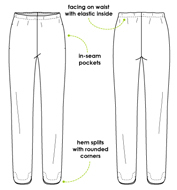 Her slacks are the Flat Bottom Flo Pant by StyleARC. 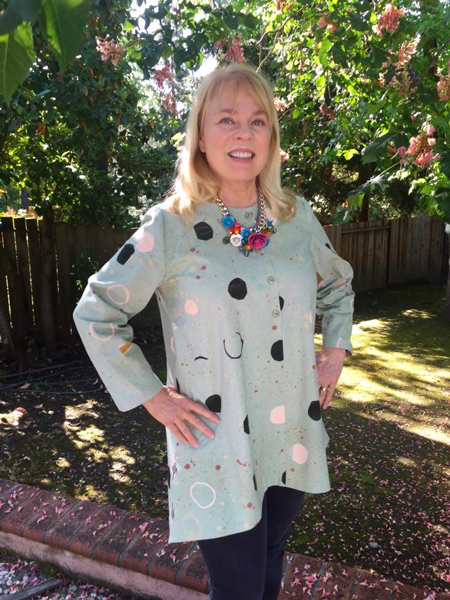 Vicki chose a border print for her Vivienne Designer Frock by StyleARC. 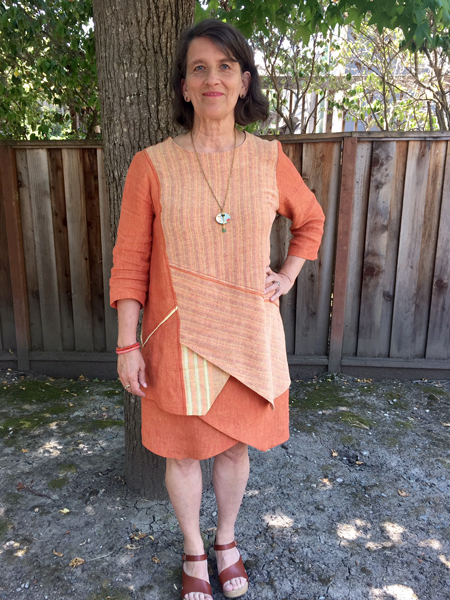 Jasna made her Toni Designer Dress in a knit from Moods in NYC. 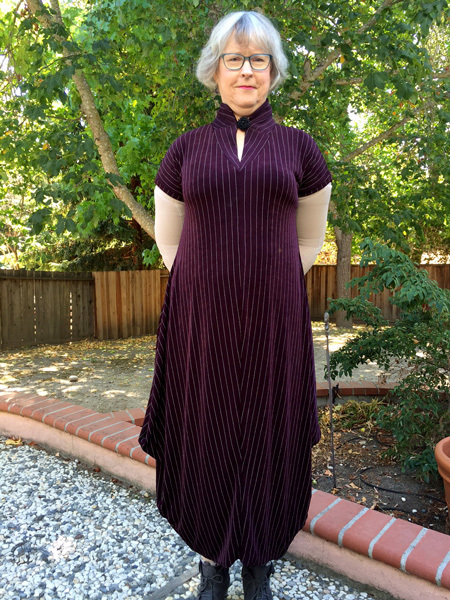 Vicki made this Toni Designer Dress in a slinky knit. 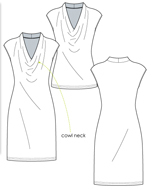 Thea's Toni Designer Dress was made with a blue print rayon. 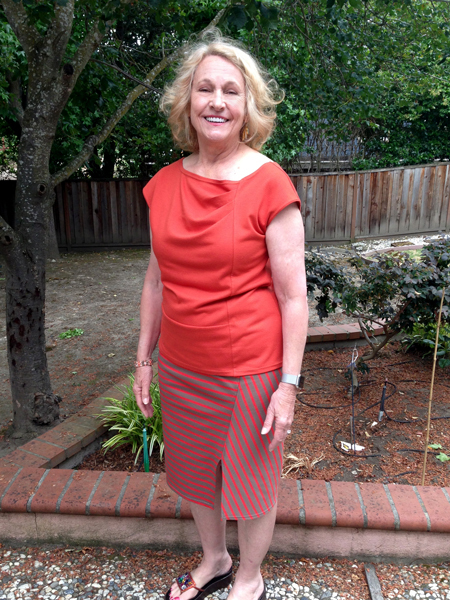 Sally's outfit is a Skye knit top and a cotton Candice skirt by StyleARC. 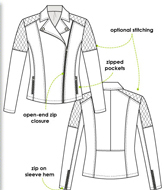 Jane selected StyleARC's Ziggy Jacket pattern for her lavendar leather jacket. 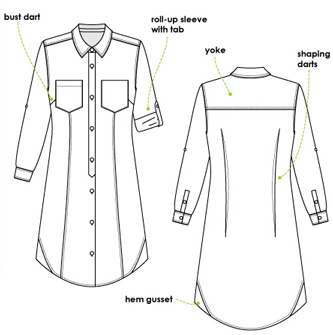 Laura used rayon for her Crystal Over Shirt and made a sleeve and cuff insert in lightweight wool. 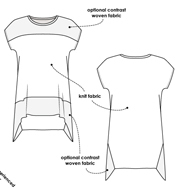 Ellen made the Crystal Over Shirt with Marcy Tilton's Japanese cottom. 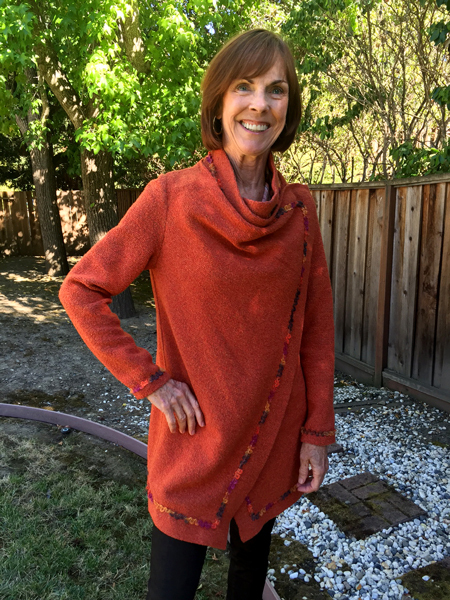 Jeanne made StyleARC's Estelle Ponte Jacket in a rust novelty boiled wool. 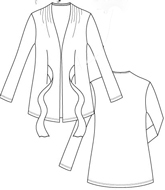 She trimmed the jacket with a braid. 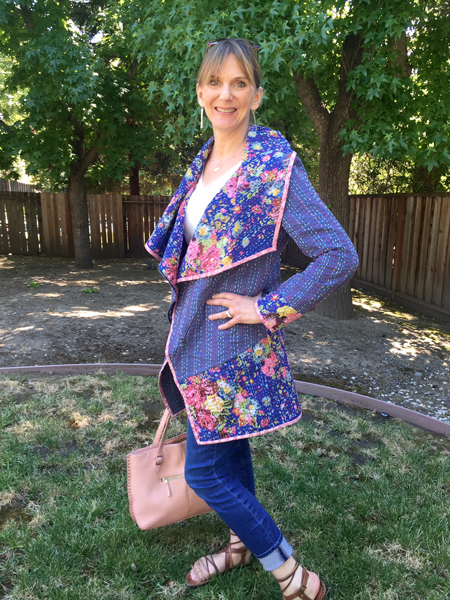 Jane used a Kantha quilt as the fabric for her Genevieve Jacket/Coat. 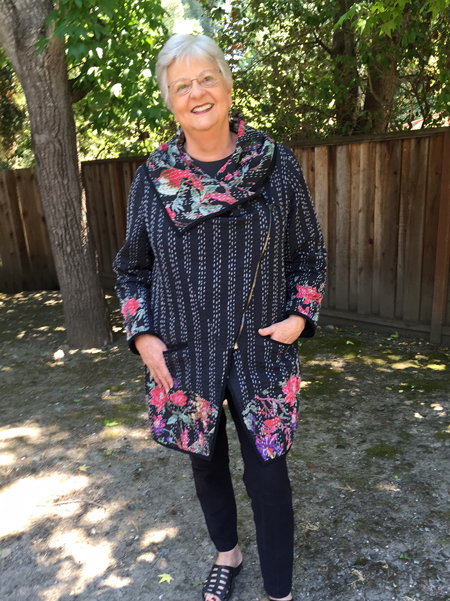 The Kantha quilt came from India and she purchased it on Ebay. 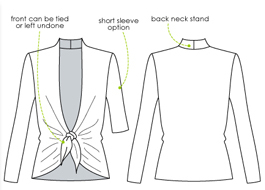 She partly lined the sleeves and back so it would be easy to slip on. 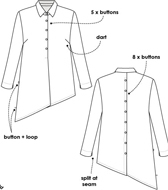 She decorated the back lining by cutting out a piece of the quilt and fuseing it to the lining. 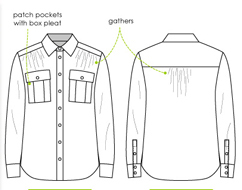 The pockets were changed to single faced welt pockets. 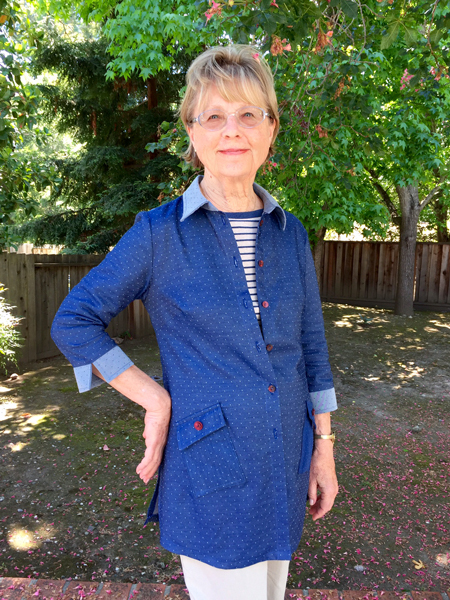 Katherine used a Kantha quilt to make the StyleARC Genevieve Jacket/Coat. 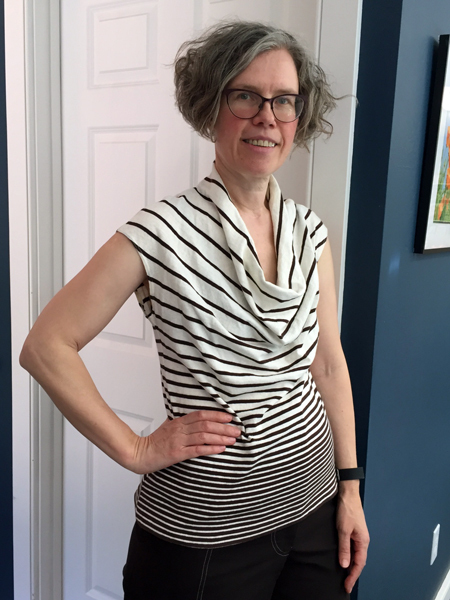 Sally used the strip fabric in an intersting way for this StyleARC Lotti Top. 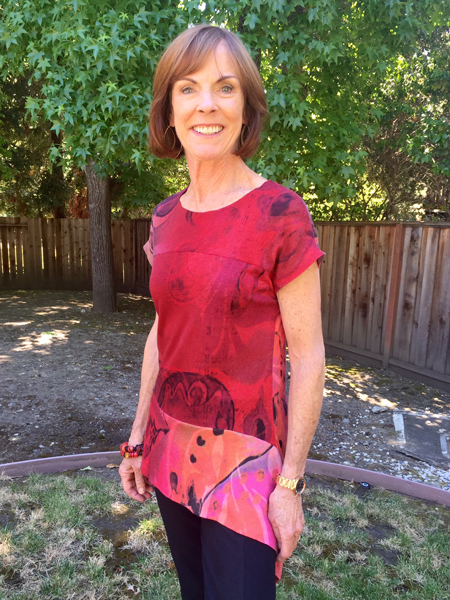 Janice used a faux leather fabric for the bottom panel of this Lotti Top by StyleARC. 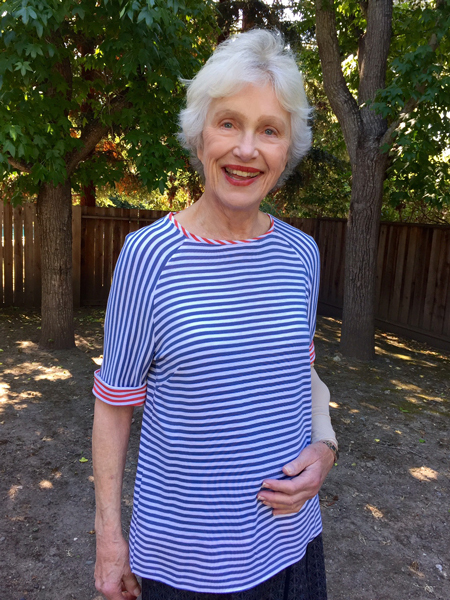 Jane selected a fabric with a sewing motif for her Angela Blouse , and used a striped fabric for the collar, cuffs, and trim. 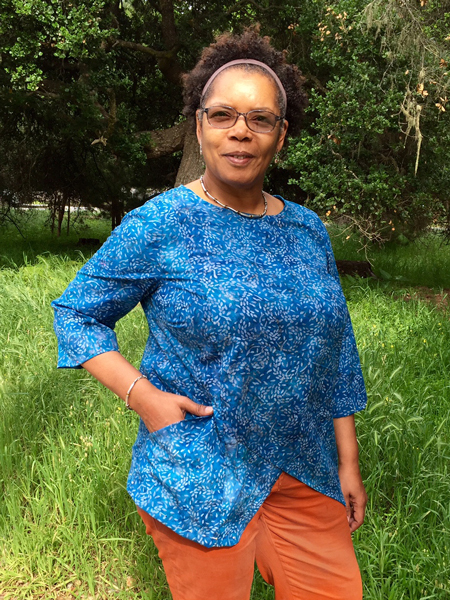 Barbara made a few changes to the StyleArc Sacha Shirt. 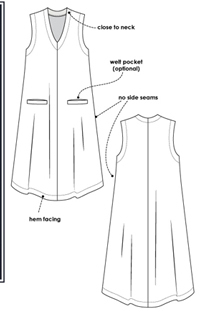 She also added pockets. 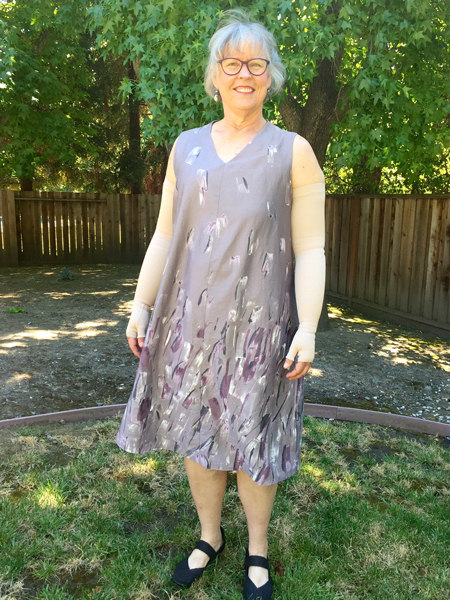 The fabric was reversible so she used both sides. 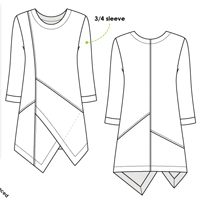 Candy used a batik to make a muslin of the StyleARC pattern Lani Tunic. 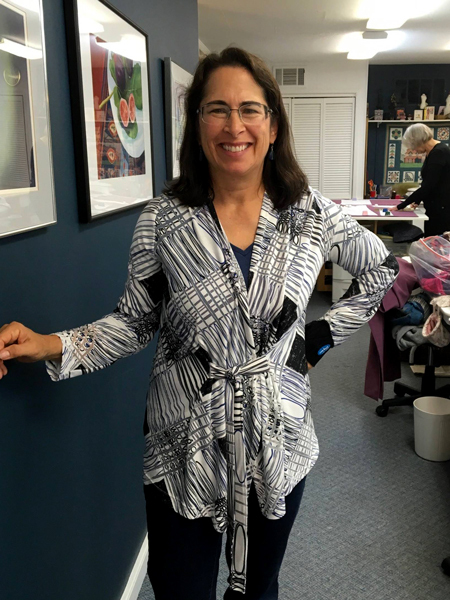 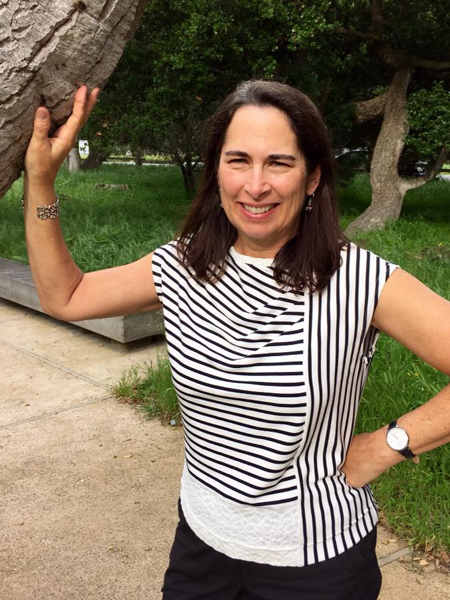 She came from New Jersey for the fitting and to attend Jane's spring Asilomar retreat. 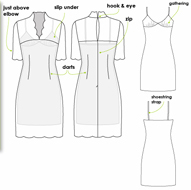 Thea used a cotton seersucker for her Italia Dress. 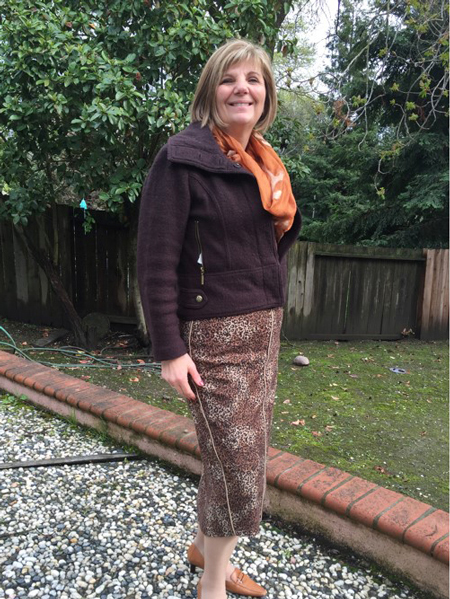 Diana created a three piece StyleARC ensemble made of knits for her trip to England. 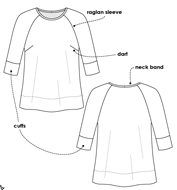 The fabric for the Abby Cardi and Lotti Top came from Stone Mountain and Daughter Fabrics. 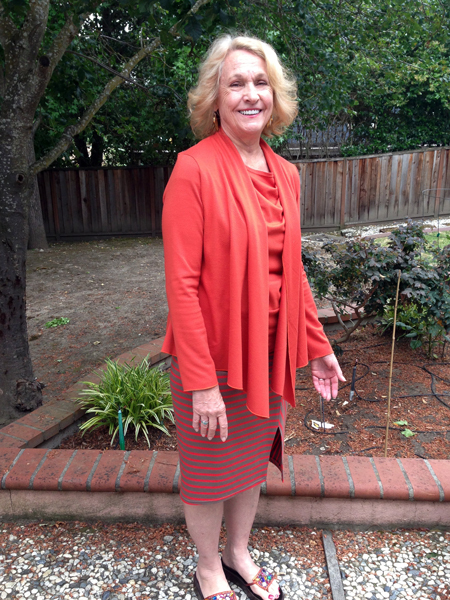 The Taylor Knit Skirt has interesting lines, and looks great with the Lotti Top. 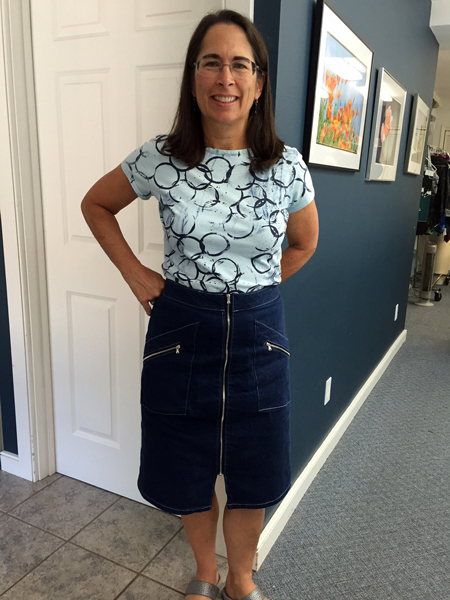 Maria made StyleArc's Mindi Skirt with the 3 zipper front in a striped denim. 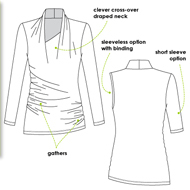 She chose a woven fabric for the Skye Top. 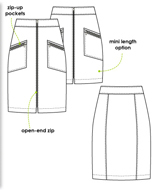 Sally also made StyleArc's Mindi Skirt. 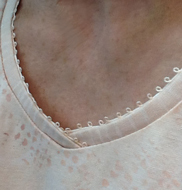 She is wearing a top she embellished by silk screening the circular pattern. 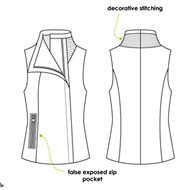 Sally has a company that will custom make a silk screen for you. 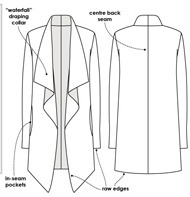 Visit her on Etsy here. 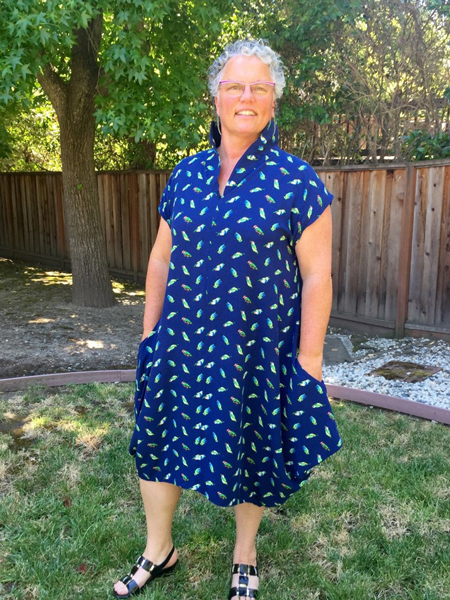 Jasna loves this Franki Dress/Top pattern by StyleARC and has made it quite a few times. 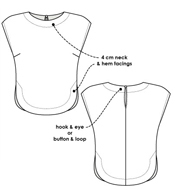 Lark used the Kendall Knit Top pattern for this garment. 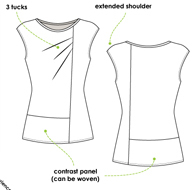 She silk screened a design onto the plain knit fabric. 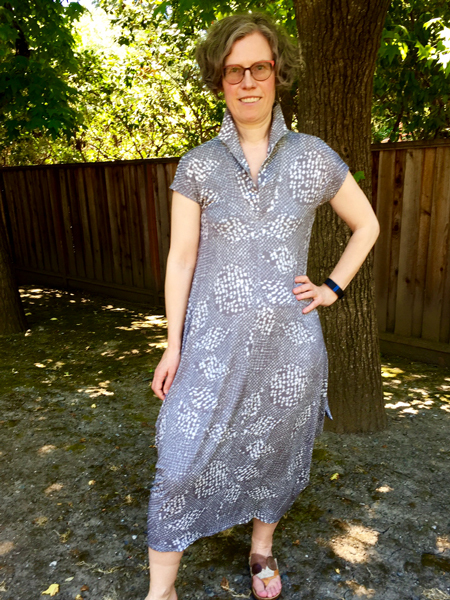 Susie made this StyleArc lace dress with a coordinating slip for her birthday party using the Alisha Dress pattern. 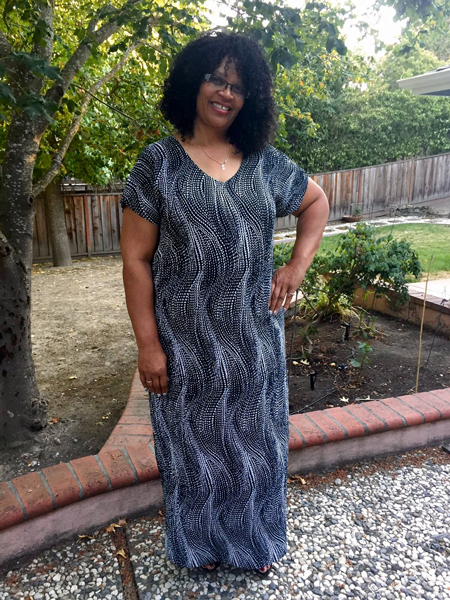 Susie purchased the Maxine Maxi Dress pattern from StyleARC and their pleated Crinkle fabric bundle. 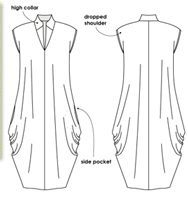 She sewed the dress in a few hours. 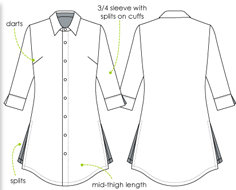 There are just 4 seams and no hem or neck edge because it doesn't ravel. 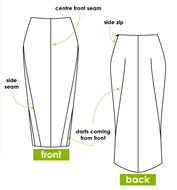 The fabric should not be pressed or put in drier but it is VERY flattering. 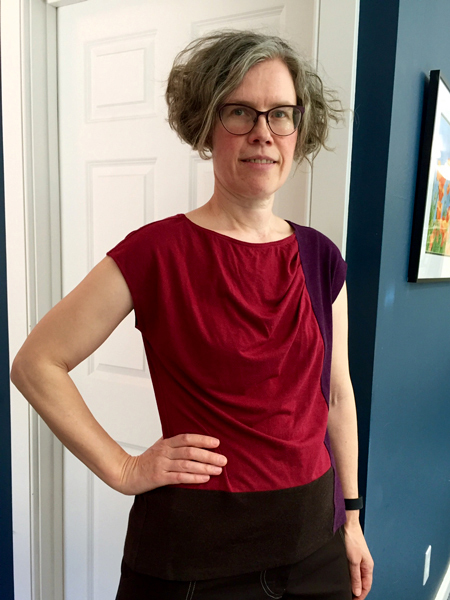 The fabric also came in red. 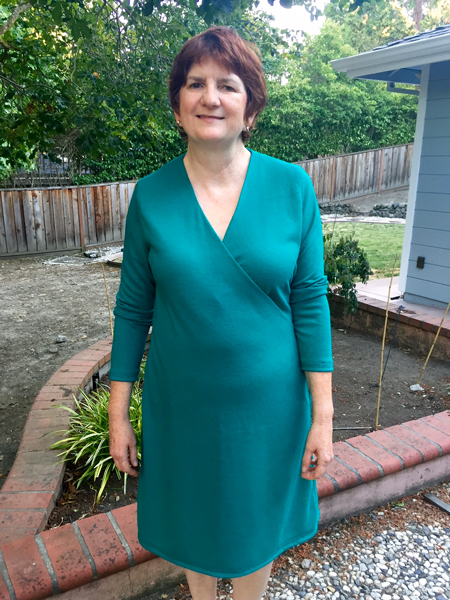 Vicki used a knit for this Slip On Suzie Dress by StyleARC. 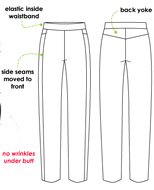 Vicki's pants were made with Barb's Stretch Pant pattern by StyleARC. 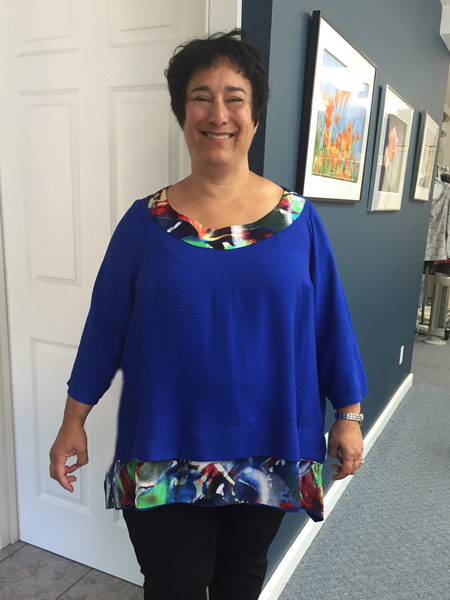 Fran loves her 3 new StyleARC garments. 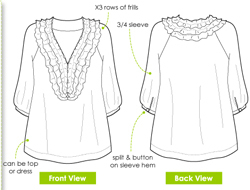 She made this beautiful silk charmeuse top that has bias raw edge ruffles at the neckline. 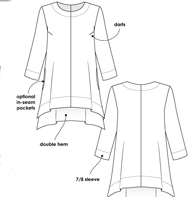 The pattern is the Lexley Blouse/Dress. 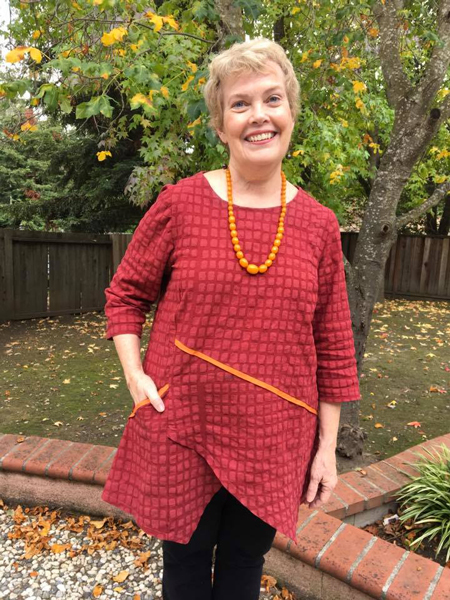 Fran made this fun knit top using the Pearl Knit Top pattern, and bottoms are the Darcy Woven Pant. 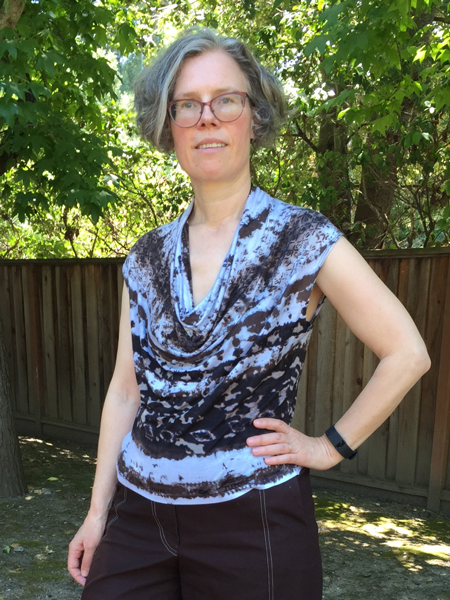 Sally made this top using StyleArc's Terry-Tie-Cardi pattern. 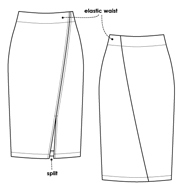 Barbara loves this Zoe Pencil Skirt. 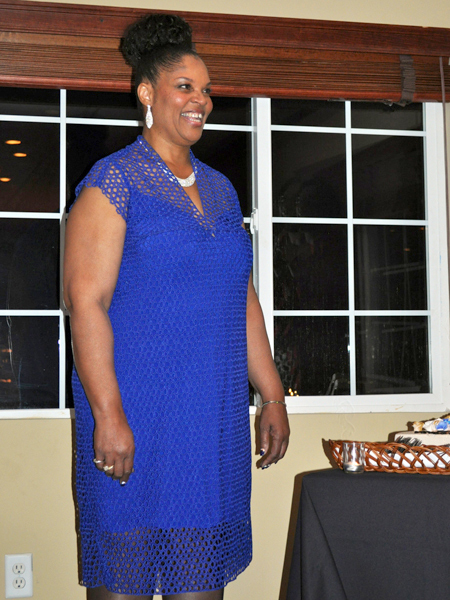 She made it at least three times using different fabrics. 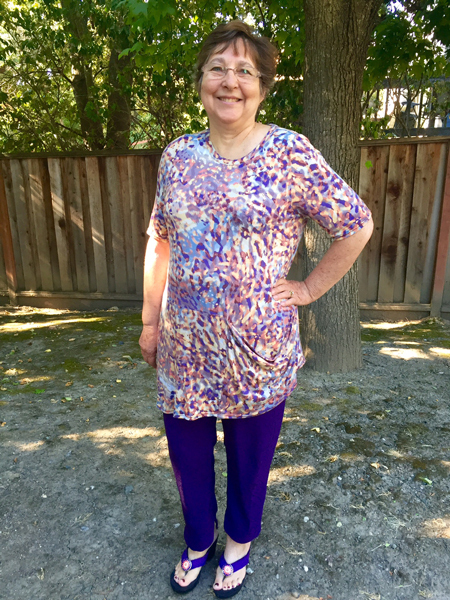 Joy used a solid and a print to make her StyleARC Dasiy Designer Tunic. 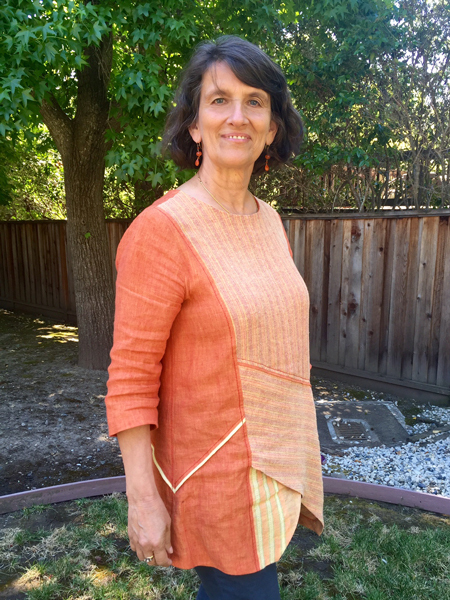 The next challenge will be to make something from a Kantha quilt.